Hummus has been an acquired taste. I know some people just love that six letter word. Or do they just love the fad? Hummus is quite the trendy dish these days. 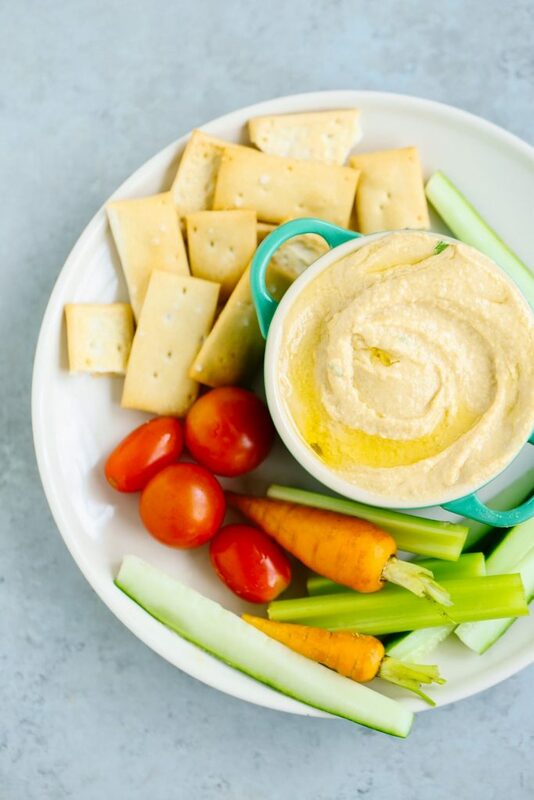 Ask for healthy snack ideas and hummus is sure to be mentioned. I’m not sure why we are such a hummus obsessed culture, but we are. 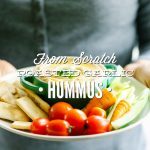 Hummus is most commonly purchased in the grocery store in a little container with a life span of a few months, if not longer. That’s a bit troubling. 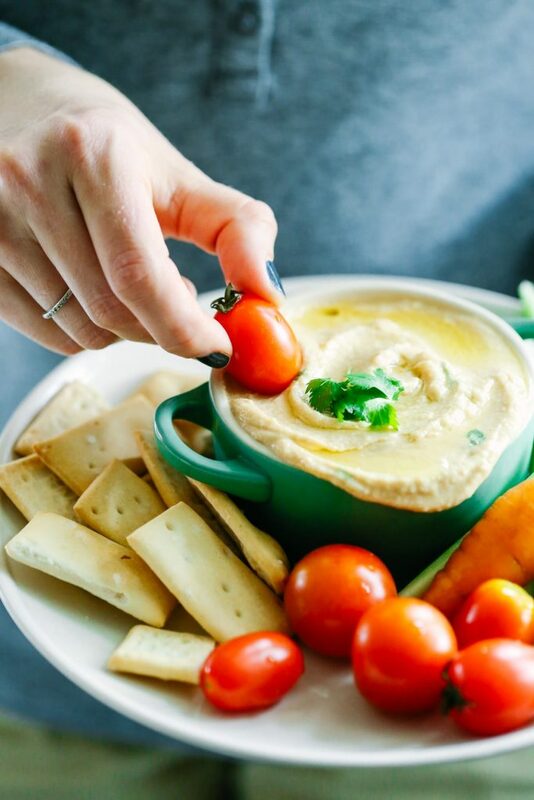 Hummus is primarily composed of a few key ingredients: chickpeas, lemon juice, Tahini (ground sesame seeds), and olive oil. Yes, Tahini and olive oil have longer shelf lives, but beans? I’ve been guilty of being too lazy to use leftovers, particularly beans. The smell that radiates from an open container of once freshly soaked and cooked beans is horrid. Not even the dogs want to partake. How can that store hummus last for months? Ingredients such as citric acid and other preservatives are added to lengthen the life. Not to mention GMO oils. That once healthy hummus turns into a laundry list of 10,15,20 ingredients. Most of which are unpronounceable to someone like myself. Cooked Chickpeas (Chickpeas [Garbanzos], Water), Tahini (Ground Sesame), Soybean Oil, Garlic, Salt, Citric Acid, Potassium Sorbate added to maintain freshness, Natural Flavors. Pretzel Ingredients: Enriched Wheat Flour (Wheat Flour, Niacin, Reduced Iron, Thiamin Mononitrate, Riboflavin, Folic Acid), Salt, Corn Oil, Malt Syrup. 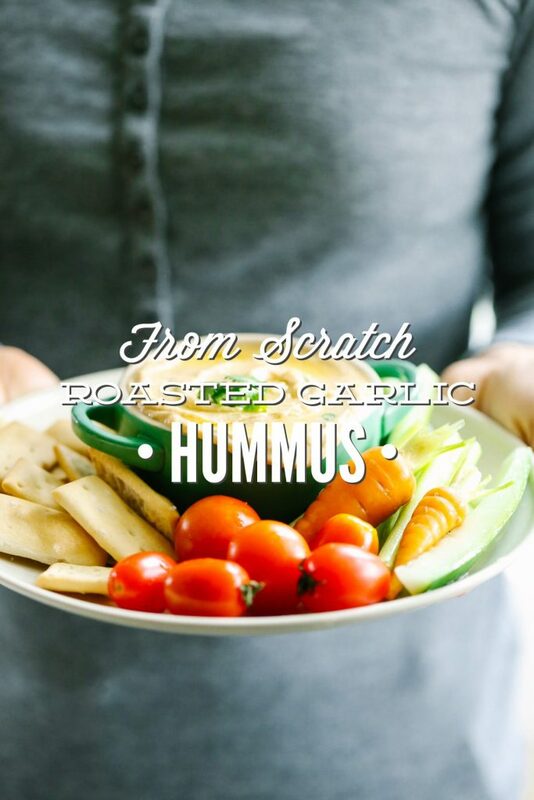 I know it sounds complicated, but homemade hummus is really easy to make. I prefer to soak and cook my own beans, but if you’d like to take a short cut, you can use canned chick peas. Gasp! Shhh, I won’t tell. And the flavor of homemade hummus is unbelievably delicious! The fresh taste can turn even a hummus hater like myself into its biggest fan. So lets get to making! A creamy, nourishing hummus the whole family will love! In a large bowl, soak 1 cup of dried chickpeas in water overnight on the counter. In the morning, drain water. Bring a pinch of salt and a few cups of water to a boil. Add in chickpeas, reduce to simmer, and cook until soft (about an hour). Roast garlic in the oven for 30 minutes at 400F (covered with foil). Remove and allow to cool to touch. 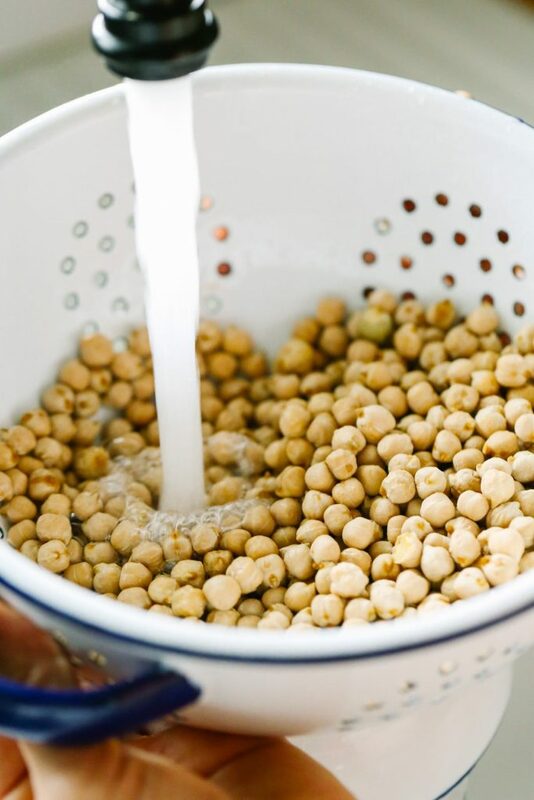 Once chickpeas are soft, drain water from chickpeas (reserve about ¼ cup of cooking water). In a blender combine chickpeas, cooking water, Tahini, juice of lemon, cumin, salt, and roasted garlic cloves (squeezed out of skin). Blend until smooth. Slowly add in enough olive oil until desired consistency. i make my hummus in a huge batch (use a whole package of dried chickpeas) and then i put it in muffin pans and freeze them. after they are frozen, i pop out the little hummus pucks and put them in a freezer bag and return them to the freezer. when i want some, i take out one or two pucks and defrost them, adding whatever i might want. my latest dish had added chopped sweet red peppers and a combo of chopped green and yellow snap beans. i make mine in a food processor and leave it kind of rustic and coarse. when it thaws it gets creamier. 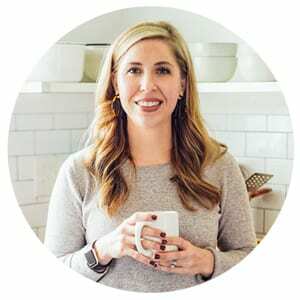 I happened upon your site last week while browsing Pinterest, and I’m quite impressed! 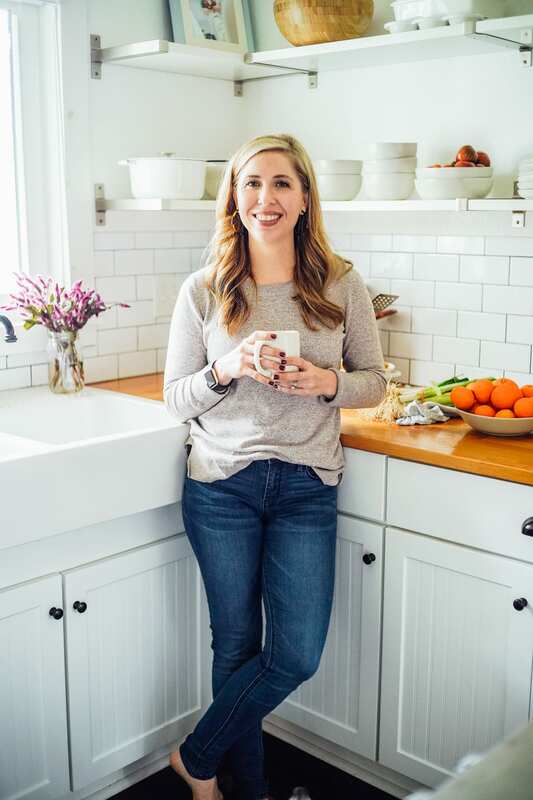 Very few “domestic goddess” blogs resonate with me – your approach is wonderfully balanced! I’ve moved to brined beans instead of cooking them in salted water. Cook’s Illustrated did a write up on it some time back, and I’m a complete convert! The basics are for every pound (2 cups) of dry sorted beans: soak in 1 gallon of water plus 3T of [sea salt] for 8-24 hrs at room temp. Drain & rinse before cooking. The difference in taste and texture (even over traditionally soaked & cooked in salt water method) is remarkable. Thank you so much that’s a wonderful compliment. And what a fantastic tip. Next time I make beans I’m going to give that a try. Just made this recipe, and WOW. I actually don’t usually like hummus, my husband does. But this is amazing!!! Definitely going to become a staple at our house 🙂 Oh, and we added lemon zest, paprika and smoked salt! Yay, Daisy!! I’m so glad you loved the hummus, and what great additions. I’m going to have to make some this weekend and add lemon zest, paprika, and smoked salt. Thanks for the recommendations. This is so yummy, my family loved it too, we will be eating this hummus on a regular basis from now on. Now I just have to learn to make pita, ha ha. Homemade pita would be AWESOME, Bethany!!! I’m so glad everyone liked the hummus. Can you wrap the garlic in parchment paper then foil? I can not cook using aluminum foil and typically cover with parchment paper first when something needs covered… Thanks! Hey Melissa, Yes, you can :).